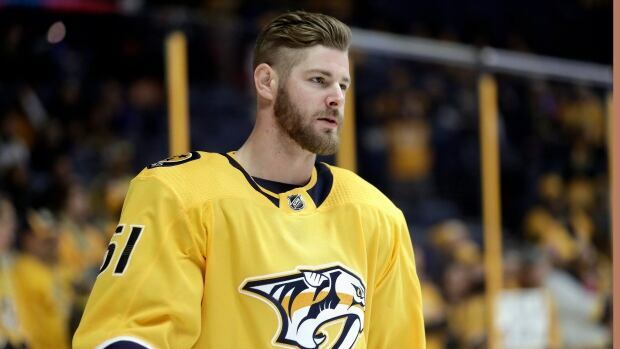 Predators forward Austin Watson has been suspended without pay for the entire preseason and first 27 games of the regular season for domestic abuse. Commissioner Gary Bettman handed down the suspension Wednesday after an investigation and a hearing with Watson last week. Watson pleaded no contest in July to a charge of domestic assault stemming from an incident in June, and the NHL found Watson engaged in unacceptable off-ice conduct. Bettman says he has determined Watson engaged in a physical confrontation with his domestic partner. The commissioner added the league cannot and will not tolerate this and similar types of conduct. The National Hockey League Players' Association says it will appeal the suspension. Watson, 26, was charged in an incident June 16 with his girlfriend after a witness flagged down a police officer to a gas station in Franklin, Tennessee. Watson told police he and his girlfriend were arguing and that he pushed her. Officers said they found red marks on her chest, and she said Watson caused them. Watson pleaded no contest to domestic assault on July 24 . The Nashville Predators issued a statement that the team supported and worked closely with the league investigation into Watson. The franchise also reiterated its support for AMEND, a program designed to teach men and boys how to help end violence against women and children. "During his suspension, we wish Austin, Jenn and their baby the best as they take the necessary steps to move forward, with the support of the Nashville Predators, the NHL, the NHLPA, and all the collective resources they can provide," the Predators said. "Our commitment to AMEND is the same today as it was when we partnered six years ago with the mission of making Nashville the safest city for girls and women." The Predators won the President's Trophy last season with Watson scoring 14 goals and adding five assists, and he tied for fifth in scoring in the post-season with eight points in 13 games as Nashville lost the Western Conference semifinals to Winnipeg in seven games. Watson was a first-round draft pick in 2010 by Nashville at No. 18 overall. Watson now would be eligible to return Dec. 3 when Nashville hosts Buffalo, the Predators' 28th game of the season.